Gerald Sensabaugh, Jr. is an American football Safety for the Dallas Cowboys of the National Football League. He was drafted by the Jacksonville Jaguars in the fifth round of the 2005 NFL Draft. 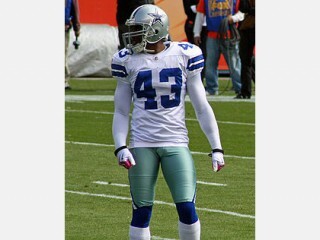 The Dallas Cowboys signed Gerald Sensabaugh on March 10, 2009 from Jacksonville to replace Roy Williams at strong safety. Sensabaugh, now entering his sixth pro season, settled in nicely in his new home, finishing sixth on the team with 81 tackles while setting a career-high with 10 pass breakups, starting all 15 games he played. With the versatility to play both safety positions, along with special teams, Sensabaugh has 249 career tackles, 23 pass breakups, seven interceptions, 28 special teams tackles and three blocked kicks. He returns in 2010 as the club's starting strong safety and is the most experienced member of Dallas' stable of safeties with the release of Ken Hamlin in the offseason. Sensabaugh has started 39 of the 65 regular season games he has played and will help lead a secondary that was responsible for 10 of the club's 11 interceptions last season. Upon arriving in Dallas, Sensabaugh was reunited with two former Jaguars coaches in secondary coach Dave Campo and special teams coordinator Joe DeCamillis. # In his first season in Dallas, finished sixth on the team with 81 tackles - second-most in a season in his career - a personal-best 10 pass breakups and an interception. Added five special teams tackles. # Made his Cowboys debut at Tampa Bay (9/13) and tied for third on the team with nine tackles. Blocked a first quarter field goal - his third career block - before suffering a back and rib injury late in the third quarter and sitting out the remainder of the game. # Finished the first-ever game at Cowboys Stadium with eight tackles against the N.Y. Giants (9/20). # Was third on the team with eight tackles while helping hold the Panthers scoreless in the second half against Carolina (9/28). # Had two tackles and a breakup before breaking his right thumb in the second quarter at Denver (10/4). # Underwent surgery on his thumb and was inactive for the overtime win at Kansas City (10/11) but returned against Atlanta (10/25) to the tune of 10 tackles - tops in the secondary and second on the team - and a season-best three pass breakups. # Had five tackles and a breakup against Seattle (11/1) before picking off his first pass as a Cowboy along with six tackles and two pass breakups at Philadelphia (11/8). # Added six tackles and a pass breakup on Thanksgiving Day against Oakland (11/26) before tacking on four stops and a deflection at the N.Y. Giants (12/6). # Notched six tackles and a special teams stop against San Diego (12/13). # At previously undefeated New Orleans (12/19), finished with two tackles as the defense held the Saints to just one-of-seven on third downs. # In the playoff clinching win at Washington (12/27), notched two tackles as Dallas posted a shutout for the first time since a 27-0 win at Washington (12/14/03). # Tied for the team lead with six tackles in the season finale against Philadelphia (1/3/10) as Dallas notched back-to-back shutouts for the first time in team history. The win also allowed Dallas to claim its 17th NFC East Division title. # In the Wild Card Playoff Game against Philadelphia (1/9/10) had four tackles and a breakup in Dallas' first playoff win since 1996. # Had four tackles in the Divisional Playoff loss at Minnesota (1/17/10). # Played in 16 games with 13 starts while playing both safety positions to total a career-best 82 tackles, good for fifth on the team. # Also made a career-high four interceptions, four pass breakups, two tackles for loss and two quarterback hurries. Added six special teams tackles and a blocked kick. # Collected three tackles and an interception in the season opener at Tennessee (9/7). # Made his first start of the season at free safety for an injured Reggie Nelson against Houston (9/28) and recorded nine tackles and a pass breakup. # Picked off his second pass of the season at Denver (10/12) while also contributing four tackles. # Started at strong safety against Cleveland (10/26) and posted two tackles. # Notched a season-high 11 tackles at Cincinnati (11/2). # At Detroit (11/9) posted nine tackles while also blocking a field goal. # Recorded four tackles and an interception - his third of the season - against Minnesota (11/23). # Notched his fourth interception of the season along with six tackles at Chicago (12/7). # Played in his 50th career game at Baltimore (12/28) with a four-tackle, one-pass breakup performance. # Opened the season starting at safety and played in two games with eight tackles and a forced fumble before suffering a shoulder injury in a week two contest against Atlanta (9/16) that sidelined him for the rest of the season. # Started at free safety against Tennessee (9/9) in the season opener and recorded eight tackles (four solo) and one fumble recovery. # Started at strong safety against Atlanta (9/16) but left the game in the first quarter with a shoulder injury. # Placed on the Reserve/Injured List on Sept. 19 with a shoulder injury. # Played in all 16 games with seven starts after assuming the starting role at strong safety after Donovin Darius was placed on Reserve/Injured Nov. 22. # Finished with 47 tackles (33 solo), two interceptions and one fumble recovery and ranked third on the team with 11 special teams tackles. # Missed the entire preseason after suffering a sprained ankle in training camp. # Recorded a team-high four special teams tackles at Washington (10/1). # Blocked a punt which was recovered by the Jaguars and led to a touchdown against the N.Y. Jets (10/8). # At Philadelphia (10/29) made his first start of the season as the team opened up in its nickel package. # Recorded six tackles, one for a loss, one fumble recovery and a team-high three passes defensed in an expanded role against the N.Y. Giants (11/20). # Started at Miami (12/3) and led the secondary with 10 tackles while also recording his first career interception. # Started against Indianapolis (12/10) and recorded an interception off Peyton Manning, his second consecutive game with an interception. # Recorded six tackles in a start against New England (12/24). # Finished the season with five tackles and a pass defensed at Kansas City (12/31). # Played in all 16 games with two starts and totaled 31 tackles. # Started the final three games of the season (including playoffs) at strong safety. # Recovered a fumble on a muffed punt that led to a Jaguars score at the N.Y. Jets (9/25). # Saw first significant action at safety against Baltimore (11/13) and finished with three tackles. # Posted a season-high nine tackles at Arizona (11/27). # Tied a season-high with nine tackles at Cleveland (12/4). # Made his first career start at Houston (12/24) and recorded six tackles. # In his second consecutive start in the game against Tennessee (1/1/06) posted two tackles. # Started his first career postseason game at New England (1/7/06) and finished with four tackles, a tackle for loss and a special teams tackle. # Played three seasons at Division I-AA East Tennessee State before transferring to North Carolina after ETSU dropped its football program. # Was a two-time All-Southern Conference selection. # Started every game at strong safety as a senior, leading the team with 78 tackles. # Majored in exercise and sport science. # Gerald Sensabaugh was a standout football player at Dobyns-Bennett High School in Kingsport, Tenn.
# Also played on offense, catching 42 passes for 420 yards and seven touchdowns in his final year. # Competed in track, winning the state long jump title. View the full website biography of Gerald Sensabaugh.